In the mass protest today against the banning of a climate change march in Paris, a pair of shoes belonging to Pope Francis was spotted on Place de la Republique, close to where 90 of the victims of the 13/11 massacre died in the Bataclan Theatre. 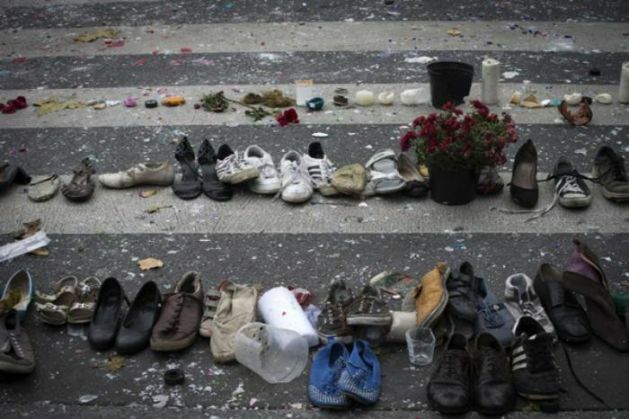 According to the Guardian, the police cancelled the demonstration on the eve of the Climate Summit and the protesters laid their shoes out on the square, including a pair belonging to the Pope. 'We can understand why the police are scared of further trouble, but we still think we should have been able to march. There are huge numbers of people, who think governments are not doing enough to limit damage to the environment, and that includes the Pope,' the organiser of the protest was quoted as saying. UK Prime Minister David Cameron, US President Barack Obama, China's Xi Jinping, India's Narendra Modi and Russian President Vladimir Putin are set to attend the start of the Paris conference, which is tasked with reaching the first truly universal climate pact.